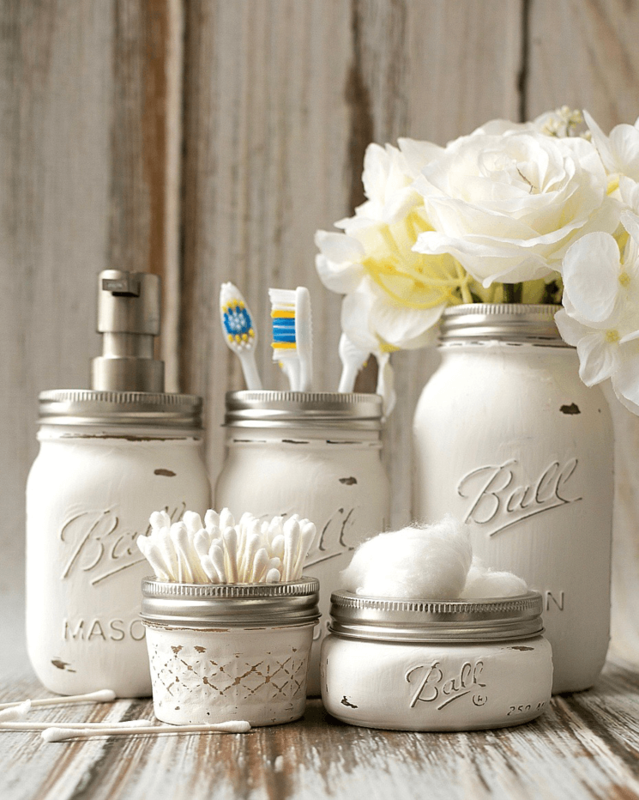 When it's time to give your bathroom a fresh new look, look no further than your stash of mason jars! Nothing beats a mason jar in terms of versatility! Canning and food storage are just the tip of the iceberg for these iconic jars! Over the years I’ve used mason jars as flower vases, drink cups, coin banks, candy dishes, mixing bowls, measuring cups, and more! But today I want to focus on a relatively unexplored frontier for mason jars (for me anyways! )—using mason jars in the bathroom. I was inspired to write this post after coming across this cute set of glass jar bathroom accessories online the other day! It comes with a soap dispenser and another jar that’s perfect for storing toothbrushes. (If you’re not much of a DIYer, this is a great way to get the mason jar look without having to take on a project.) So I started looking around the web for more ways to use mason jars in the bathroom, and I collected a virtual treasure trove of DIY ideas! I’m excited to share these cute, creative, and practical ideas with you. Be sure to click on the title of each project to see more photos and full details about how to make it (or buy it) yourself. Hopefully this list inspires you to incorporate mason jars into your own bathroom for decor, storage, or organization! Turn a mason jar into a stylish soap dispenser with tons of rustic charm! It’s a pretty simple process, and you probably already have everything you need for it. Get the full step-by-step instructions by reading my post below! I love this mason jar bathroom set. The burlap accent is a nice touch, and you could use the jars to store just about anything you need! I couldn’t resist including this bathroom set as well. White is one of my favorite colors to decorate with, because it always brings a fresh and home-y feeling into a room. These mason jars were painted white and slightly distressed, and the finished product looks magazine-worthy! Use mason jars to create additional storage that saves space and looks great too! This project turns a few mason jars, a few hose clamps, and an old palette into pretty and functional storage for toothbrushes, makeup brushes, and more. This is less of a project and more of a method, but it’s pretty clever all the same. Store cotton balls in your favorite mason jar, then place a glass candle votive in the opening to store cotton swabs. The votive looks like it fits perfectly in the jar, and it’s pretty enough to display on your bathroom counter! If you can’t find a candle votive that fits as well as the one in the photo, you can buy this insert online. It’s designed to fit in a mason jar, so you won’t have to worry about it not fitting right. If you don’t have a collection of mason jars just sitting around waiting to be used, never fear! You can upcycle a few empty pickle jars into cute storage jars that will look great in any bathroom. I just love how the knobs look on top of the colorful jar lids! Here’s another mason jar and hose clamp project, but this one fits right under the bathroom mirror. It’s perfect for toothbrush storage, and everyone can have their very own jar. It’s perfect for kids; they’ll love having their very own jar to keep their toothbrush and toothpaste in. These pretty rose gold jars are sure to add a pop of glamour to your bathroom or vanity. You can buy sets of these painted jars in several different colors and sizes from LargoJars on Etsy, but you could easily make your own at home too! Transform a couple of plant pot saucers, a candlestick, and a few mason jars into a tiered bathroom organizer! It looks great as a finished product, and the tiered design would definitely help save you some counter space in the bathroom. From looking at this site, apparently your thinking is that nobody uses canning jars any more. Must be the area you live in or the mind set of the people in your area.’ I live there are many people that still can and freeze food. One can make jams and jellies, can vegetables and or fruit, make pickles. I for one, make pickles, can tomatoes and ‘my husband enjoys making jelly. There are several in the area I live in that do this type of thing. I also freeze some vegetables and fruits. Nothing wrong with glass in the bathroom if you don’t have kids and you are careful where you put it. Lovely ideas and I can’t wait to try them! REALLY cute ideas but I’m also one that doesn’t care for glass in the bathroom. Some of those could go into other rooms though. Those are really cute, but I don’t like glass in the bathroom. I guess it stems from my Grandma and no glass around her pool. Same concept-no glass in an area of bare feet. If there were plastic Mason jars, I’d be willing to try some of these ideas. They do have plastic ones you can buy designed as drink cups. They come in colors, with a lid. The tiered shelf, because it’s made with painted terra cotta plant saucer, I would add felt to the bottom to keep it from scratching countertop. BTW: A small circle of hot glue around the bottom of a jar keeps it from sliding around on counter tops. Great ideas.My Sister has used the pickle jars for their bathroom.She and her husband are very frugal. These would even be great for storing things under the sink and they would be protected if ever there was a leak. I opened my doors under the sink and found everything soaked and molded! Lost a lot of Q-tips, bandages, etc… If on they had been stored in glass jars.